I clearly remember writing this report yesterday – Angie received the email version that is sent to subscribers to this site, yet it is missing from the archive of postings. No idea why. So here is a copy of Angie’s email version, just to bring my archives back up to date – apologies to those that follow the blog for receiving this duplicate (for you) posting. Today was a relatively short drive, so we took it easy getting ready and having breakfast – well, it was Sunday after all! We were on MEX1 some 5 km after leaving the hotel and SatNav suggested our next turn 183 km time. This stretch of MEX1 can not be accused of being the most scenic as we drove through mostly flat agricultural land and roadside villages where local traffic crossed in and out and dirt tracks crossed the main road at 4 way Alto signs, a sort of Russian roulette where so far we have won. Angie’s cold was now at its peak so there was little motivation to stop and search for cacti, even though some Dudleyas were spotted. Although my cold had run its course a few days ago, my back, put out during a sneezing fit, was still very stiff and sore, giving rise to the ‘old boy penguin walk’ when ever I had sat down for more than a few minutes. 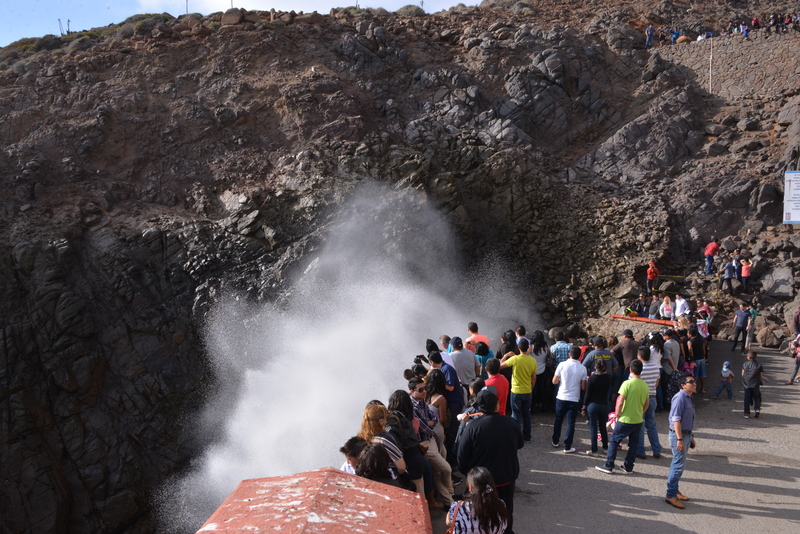 I had wanted to show Angie La Bufadora, a natural ‘blow hole’ where the sea forces itself between ever narrowing rocks producing a high water spout at the end. I looked for its location on SatNav, but the nearest location by that name was near San Francisco, CA – the one where Scott McKenzie urged people to wear some flowers in their hair during the 1960s. I had almost given up, when some 15 km south of Ensenada Angie spotted the sign and left hand turn. I had been here before in 2011 after the Isla Cedros trip with friends from Japan, but on that occasion we had not ventured farther than the La Bufadora Restaurant. I believe it had been a weekday, so not many people around. This time, on Sunday, the place was heaving with local tourism. The last km or so up to the blow hole was on foot, passing loads of stalls selling souvenirs, pina coladas and all manner of snacks. We told the persistent salesmen that we might come and shop on the walk back but first wanted to see people get wet. We were not disappointed and I managed to get some 10 video clips and a number of images that illustrate what it was all about. Sadly, wordpress wants me to upgrade to include video, so a still image will have to do for now. La Bufadora, south of Ensenada, Baja California.